^ Lietuvos Respublikos Konstitucinis Teismas. 立陶宛宪法法院. 1998. 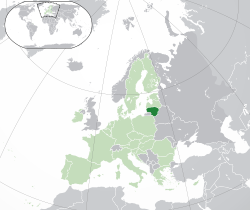 ^ 4.0 4.1 4.2 4.3 Lithuania. World Economic Outlook Database. International Monetary Fund (IMF). April 2016 [2016-06-09]. ^ Composition of macro geographical (continental) regions, geographical sub-regions, and selected economic and other groupings. 联合国统计司. [2008-11-09].